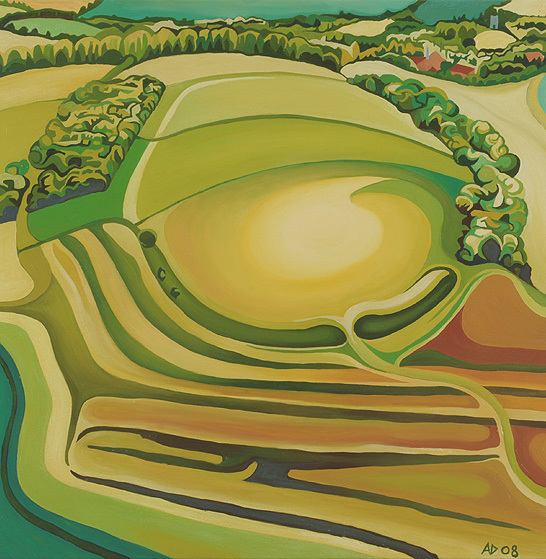 Started in 2006 and completed in January 2008, the Eye on the Hill is taken from an aerial photo of the local Iron Age hill fort called Blewburton Hill. The photo was taken as part of series of photos for the book A View from the Hill. I was kindly given permission to use this photo as reference from one of the contributors of the book. Blewburton Hill is located between the villages of Aston Tirrold and Blewbury in Oxfordshire. � 2010/11 ANNA DILLON THE ARTIST. All rights reserved.